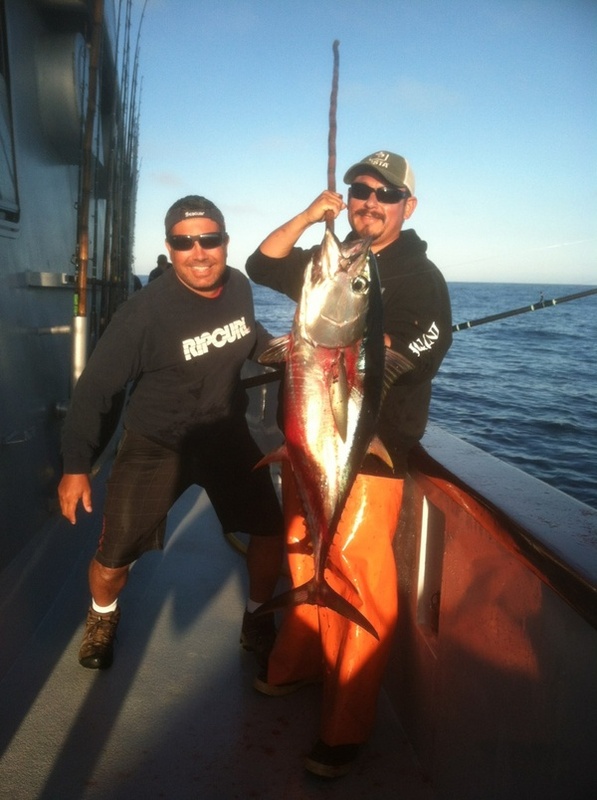 Indpendence lands 71 Bluefin at "Bluefin Heaven"
"Hello Gang," reported Independence skipper Paul Strasser June 30, "We departed out of Point Loma at 5:30 p.m. Saturday and picked up a nice load of bait at the receivers. At noon today we were in the bluefin heaven. The line of choice was between 25 to 30-pound test. After the smoke cleared we landed 71 Bluefin, with lots of casualties. Everyone on board is having a great time; some are first timers and 4 young kids. We're going to be drifting some tonight and preparing for another turn at this in the morning." The Indy will be at PLSF at approximately 6am on Monday. Hello everyone, this is the late final from our first of three shorter type 2.75 day trips we have on the summer schedule. 1st place jackpot was caught by Allen MacKenzie a 33 lb. bluefin tuna, 2nd place was landed by 8 year old Rider Mavar with a 31.8 lb. bluefin and 3rd place fell to Riders dad Jason Mavar with a 30.6 bluefin. Totals for the trip were 112 bluefin tuna and 6 yellowtail. We want to thank everyone who made the trip and hope to see you again on the Independence soon. "We departed on a 5-day trip yesterday," noted Independence skipper Jeff DeBuys July 3, "with an eager group, and some sardines. We got down to the zone at daybreak, and saw sign right away. After a few hours, and schools of fish things really slowed down. Late in the afternoon we saw another deal that did not bite. We did end up with 70 or so mixed fish, most of which are bluefin tuna. We did have one standout angler, John Collins, who just missed the tuna grand slam, as he caught a daily limit of bluefin tuna, a 35-pound albacore, and a 30-pound yellowfin tuna. All he needs is a big eye tuna. The weather is really good, and looks to stay that way for a few days. We are going to try an island for tomorrow's activities." Indy's on The 23 Spot! Here on The Ridge, yellowtail to over 40 pounds gang-bite all day long, on everything we show 'em: sardines, iron jigs yo-yoed and on the surface, swimbaits and sinker rigs. Frenzied yellows swarm and push after my mint-colored surface jig to see which fish gets the prize to chew, shoving one another to get the iron. We release dozens. Dorado crowd under floating kelp, blast out as we slide up to the paddie, backs knifing out of the water, greyhounding right up to the Indy. Yellowfin tuna snap with great vigor! Chef Ed and assistant Michele set three fine meals and two snacks daily: prime rib, Eggs Benedict, rack of lamb, delicious chicken and fresh yellowtail with sauce and vegetables. Step aboard Independence with owner-skipper Mark Pisano, Captain Jeff DeBuys and host Bill Roecker, for the fishing time of your life! Hello Anglers the crew of the Independence, wish you all a very Happy 4th of July. Please be safe. Mark Pisano, Paul Strasser, Jeff Debuys, Judy, Doug, Kevin, Matt, Tyler, Michel,Ed, Paul M., Rolf, Oscar and Jesus. "Wow, what a nice day we had today," remarked Independence skipper Jeff DeBuys July 5. "There were many biting schools of 25 to 35-pound bluefin tuna for all to enjoy. We had a wonderful time watching the show, as well as pulling and yanking, sun up into the dark. We easily caught our limits for the day. We are going to try for 'em again in the morning, please wish us luck, Jeff and the Indy crew." The Indy will arrive at Point Loma Sportfishing at approximately 6:45am.. Anglers departing on 7/7 should arrive no later than 1pm for sign in. Jackpot winners from our 5 day open were as follows: Brian Silverstein with a 39.4 yellowfin tuna took home 1st place, 2nd place was caught by Peter a 31.2 Bluefin tuna and 3rd place fell to Gary Samarin with his 31.0 Bluefin tuna. We want to thank everyone on the trip. Trip totals were 301 Bluefin tuna, 49 yellowtail and 11 yellowfin tuna for the trip. "This is the late final," noted the report from Independence July 7, "from our first of three 2.75 day trips we have on the summer schedule. 1st place jackpot was caught by Allen MacKenzie a 33-pound bluefin tuna, 2nd place was landed by eight-year-old Rider Mavar with a 31.8-pound bluefin and 3rd place fell to Riders dad Jason Mavar with a 30.6 bluefin. Totals for the trip were 112 bluefin tuna and six yellowtail. We want to thank everyone who made the trip and hope to see you again on the Independence soon." "Good evening from the Independence," said the report for July 12. "The biggest news is the weather has come down, and it is gorgeous out here. We are on a three-day trip, and covered lots of water today the first day of fishing. We caught 29 bluefin tuna, and some yellowtail for our efforts. We are going to give it another go tomorrow, so please wish us luck, the Indy crew." "We made a few drifts for Reds and Lings this morning on our way home and had a blast doing so," noted the report from Independence July 13. "The bottom dwellers were biting and everyone gets to add some more variety to their catch. We would like to thank Bob Douglas and Ed Tschernoscha from Baja Fish Gear for their sponsorship on this nine-day adventure. This light load of 17 anglers is taking home a nice catch of mixed Bluefin and Yellow fin Tuna, Limits of Big Yellows, bonus Halibut, and plenty of assorted Cod for their trip. We hunted very hard for some bigger Bluefin in the last couple of days and found several spots, but they just wouldn't bite for us. Overall it was a very fun trip with a great group of many regulars and a few new comers. Several of our anglers landed their first ever Bluefin and that is always a nice moment to share." "Today was just what we needed," said the report from Independence for July 16. "We are on a 7-day west coast marketing event, and today was our first day of fishing. Yesterday was spent traveling, and rigging for the trip. Along with the usual fantastic give always, there was a huge raffle for all. 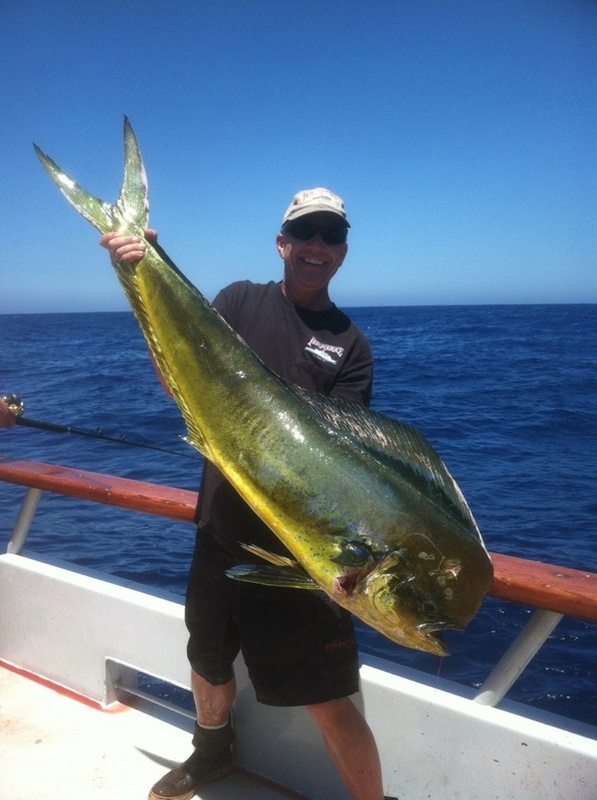 Back to today, we had a very busy day on 18 to 28-pound yellowtail, and 15 to 35-pound tuna. We are going to try this again tomorrow, please wish us luck, Jeff and the Indy crew." Hello everyone, we have 2 openings on the next 7 day adventure departing on 7/21. Jeff and Paul just called in to say fishing the last two days has been great on the current 7 day trip. Give us a call if you want to spent a week fishing on the big Indy!! 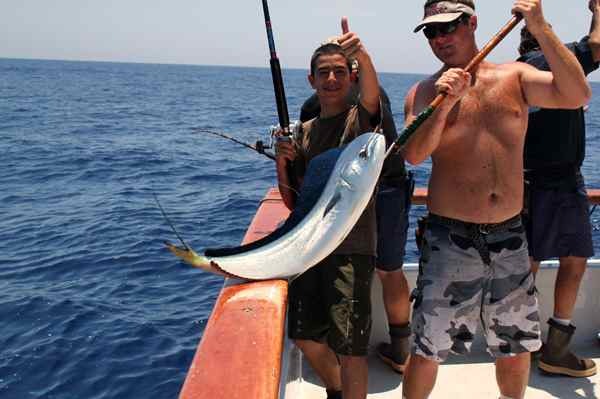 "We had another excellent day here on the Independence," said the report for July 17, "as we caught big yellowtail, big bull Dorado up to 40 pounds, and had good fishing for tuna up to 45 pounds, which kept us busy all day long till dark. Everything was working, and quite a few of the big ones were caught on the Salas 7x and 6x Jr. jigs, Dorado and tuna included. Again the weather is spectacular. We are going to get some altitude, and see where we are tomorrow afternoon. There are a few openings on the next 7-day trip this Saturday. Thanks for checking in, Jeff and the Indy crew." The Indy will be in at approximately 5:30 am..departing Anglers get to the landing early to get parking..Saturdays for all the boats are busy..
see you all in the AM. FYI, The Indy is in a Bluefin bite this morning..
Hello everyone, we have 1 opening on the next 7 day adventure departing on 7/21. Jeff and Paul just called in to say fishing has been great on the current 7 day trip. Give us a call if you want to spent a week fishing on the big Indy!! 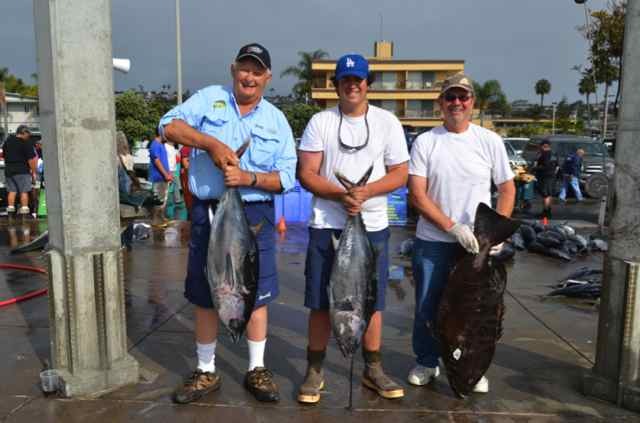 "We used yesterday to travel up to the offshore bluefin grounds,"" observed Independence skipper Jeff DeBuys July 19, "and today was just what we had hoped for, as the tuna were cooperative and good grade 25 to 35 lbs. for the most part. We had 110 fish at the end of the day. The weather is flat calm, and so here we sit waiting for tomorrow, as we are going to finish the trip right here with hopes of another decent day." Hello everyone, the returned from West Coast Marketing/Avet reels seven-day adventure with a fantastic catch of yellowfin and Bluefin tuna, Yellowtail and Dorado. Jackpot winners for the trip were Dale Lethcoe with a 40.6 lb. Dorado, 2nd place went to Timothy Fry for his 39.8 yellowfin tuna and Scott Parada with a 39.6 yellowfin tuna. A big thanks to Rick Ozaki and Dave Rocchi from West Coast Marketing as well Harry and Sarkis for Avet Reels for being our sponsors for this trip again this year. We want to thanks all the folks that made the trip also. We are back out with the Baja Paddy hoppers group and have a nice load of sardines on the boat as we head south in good weather with high hopes of a repeat of the last trip. Thanks for checking in on us and wish us lots of luck. On another note we have 3 spots open on the next 6-day trip departing Sunday the 29th for anyone that would like to join us. "Hello everyone," said the report from Independence July 23, "we have been fishing the bluefin zone the last two days and have been enjoying excellent fishing on 25 to 38-pound bluefin tuna. Our weather is nice as well, with about 10 to 14 knots of wind and a mild sea state with overcast Sky"s and 70 or so on the air temps. The 30 and 40-pound test line and leader with a hot 'dine has been the ticket to hooking these beauties. We still have a couple of opening on the next trip so give us a call for more info." Good day to all. Today was one of those days us as fisherman dream about, good fishing conditions in nice weather and biting fish all day long. We caught bluefin in the 18 to 35 lb. range to our hearts content. Many times during the day you could look around the boat and would be hard pressed to find someone who did not have a fish on. So with close to limits on the bluefin we headed for some variety and color to add to our beautiful load of BF. Late today we also picked up some yellowfin tuna and Dorado on our way to the next stop. We plan on yellowtail fishing tomorrow. Thanks for checking in, Mark and the gang. The Independence catches Bluefin "to our heart's content"
"Today was one of those days us as fisherman dream about," wrote Independence owner-skipper Mark Pisano July 24, "good fishing conditions in nice weather and biting fish all day long. We caught bluefin in the 18 to 35-pound range to our heart's content. Many times during the day you could look around the boat and would be hard pressed to find someone who did not have a fish on. So with close to limits on the bluefin we headed for some variety and color to add to our beautiful load of BF. Late today we also picked up some yellowfin tuna and Dorado on our way to the next stop. We plan on yellowtail fishing tomorrow. Thanks for checking in, Mark and the gang." Hello again from all of us here on the Indy, We have changed gears the last couple of days and put our focus on some of the other species and had really good fishing on yellowtail in the 18 to 25 lb. class as well as dorado and yellowfin tuna in the 12 to 30 lb. class. The guys had a blast fishing with the surface iron and yo yo jigs for the yellows. Weather remains good for us also. We are headed north and may do a little calico bass catch and release today at one of the islands. We will check back in with an update and ETA tomorrow. Have a great day the Indy crew. Today we rested our sore arms and spent the day doing a little catch and release on the calico bass and small yellowtail in nice warm, calm weather. We will post an ETA later as the weather has come up a bit and there our a few boats getting in on the same day. Have a good day, the Indy crew. The Indy will arrive at 6:45am on Saturday Morning. Ernie Alex Montano, LA HABRA, CALIF.
"We started off our 6 day trip in a big way today," said skipper Jeff DeBuys July 30, "as we ran and ran, finally got down here after lunch, and got a school and drifted till dark. It was really good fishing for bluefin tuna, yellowfin tuna, and Dorado. When we got all tallied up we had 225 mixed fish for our efforts. Everyone had an absolutely excellent time pulling and yanking. We are going to give this another try for tomorrow."